Tasks must be repeated every time you make a change. You begin with good intentions but the infallible front end developer will forget to compress an image or two. Over time, tasks become increasingly arduous and time-consuming; you’ll dread the inevitable content and template changes. It’s mind-numbing, repetitive work. Would it be better to spend your time on more profitable jobs? If so, you need a task runner. choose task runner software and stick with it for a while. Part of the tools may be new to you but take a deep breath and concentrate on one thing at a time. Features such as file watching were built-in. Gulp plug-ins were (mostly) designed to do a single job. 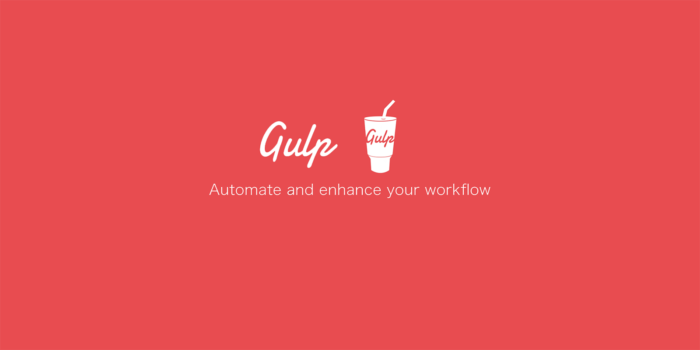 Gulp was faster because it uses Node.js streams to pass data through a series of piped plug-ins. Files were only written at the end of the task. Of course, Gulp itself isn’t perfect and new task runners such as Broccoli.js, Brunch and webpack have also been competing for front end developer attention. More recently, npm itself has been touted as a simpler option. All have their pros and cons, but Gulp remains the favorite and is currently used by more than 40% of web developers. This guidedescribes how to use Gulp 3 – the most recent release version at the time of writing. Gulp 4 has been in development for Part time but remains a beta product. It’s possible to use or switch to Gulp 4 but I recommend sticking with version 3 until the final release. Node.js can be downloaded for Windows, Mac and Linux from nodejs.org/download/. There are different options for installing from binaries, package managers and docker images – full instructions are available. Note for Windows users: Node.js and Gulp run on Windows but some plug-ins may not install or run if they depend on native Linux binaries such as image compression libraries. One option for Windows 10 users is the new bash command-line; this solves many issues but is a beta product and could introduce alternative problems. You will be asked a series of questions – enter a value or hit Return to accept defaults. A package.json file will be created on completion which stores your npm configuration settings. This installs Gulp as a development dependency and the "devDependencies" section of package.json is updated accordingly. write tasks which utilize those plug-ins to do something useful. It’s possible to write your own plug-ins but, since almost 3,000 are available, it’s unlikely you’ll ever need to. You can search using Gulp’s own directory at gulpjs.com/plugins/, on npmjs.com, or search “gulp something” to harness the mighty power of Google. gulp.task – defines a new task with a name, optional array of dependencies and a function. gulp.src – sets the folder where source files are located. gulp.dest – sets the destination folder where build files will be placed. Any number of plug-in calls are set with pipe between the .src and .dest. The remaining new or changed files are piped through gulp-imagemin which sets an optional optimizationLevelargument. Try running gulpimages again and nothing should happen because no newer images exist. ensure dependencies are loaded first using the gulp-deporder plug-in. This analyses comments at the top of each script to ensure correct ordering e.g. // needs: defaults.js lib.js. Finally, let’s create a CSS task which compiles Sass .scss files to a single .css file using gulp-sass. This is a Gulp plug-in for node-sass which binds to the super-fast LibSass C/C++ port of the Sass engine (you won’t need to install Ruby). We’ll presume your primary Sass file scss/main.scss is responsible for loading all partials. Save and enter gulp run at the command line to execute all tasks. Note I omitted the images task because it’s already set as a dependency for the html and css tasks. gulp-nodemon – uses nodemon to automatically rebegin Node.js applications when changes occur. One useful method in gulp-util is .noop() which passes data straight through without performing any action. This could be used for cleaner development/production processing code, e.g. Gulp can also call other Node.js modules – they don’t necessarily need to be plug-ins, e.g. del – delete files and folders (perhaps clean your build folder at the begin of every run).